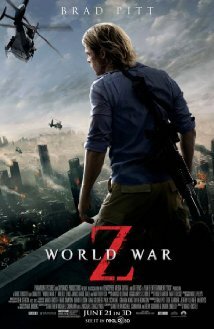 World War Z is a zombie outbreak flick that uses the monsters in a very different way than they are usually portrayed. These zombies are rampaging. They swarm, and stampede, and toss themselves around with wreck-less abandon. Like many other recent incarnations of zombies, they are stimulated by sound. The last thing you want to do is draw their attention by making noise. The zombies are the result of an unknown outbreak, thought to have started in South Korea. The outbreak has spread so quickly that it has engulfed many countries around the globe. Here in the U.S., high ranking government, military, and U.N. officials have taken refuge on battleships out at sea. This is where Gerry Lane (Brad Pitt) and his family find themselves after their home city of Philadelphia succumbs to the outbreak. Lane is a former U.N. Investigator who had retired so that he could spend more time with his family. He's sucked back in when his former handler Thierry Umutoni (Fana Mokoena) informs him that space on the battleships are reserved for necessary personnel only. In short, he is coerced into investigating the outbreak in order to allow his family to keep their safe space on the ship. Gerry travels to South Korea with a U.S. Navy SEAL unit and a doctor that believes he can find a cure for the outbreak if he can find 'patient zero' (the beginning of the outbreak). It is there at Camp Humphreys that they learn from Captain Speke (James Badge Dale) and an ex-CIA Agent in holding (David Morse) that there are no answers left in South Korea but that Jerusalem has managed to quarantine itself from the world and that it is now their best hope to combat the outbreak. The investigation continues with a few more turns and loads of action thanks to the rampaging zombies. When the first trailer was released a few months ago, I had heard that the movie was very different from the book. After seeing the film and talking to a couple others who have, I've been told that the story is very similar, but the view from which the story is told has been changed. Brad Pitt is quite good, and Badge-Dale, Morse, and Mokoena are also in their limited roles. Matthew Fox even pops up for a couple quick scenes, although barely enough to even realize that it is him. The other performance that stood out to me in this film was from Daniella Kertesz, who plays Segen, a soldier from Jerusalem who helps Gerry escape. World War Z was a pleasant surprise for me. I had been worried when I had heard that it differed drastically from the book (I tend to prefer it when source material is kept to relatively faithfully - even if I have not yet read said source material). As a result, I hadn't really gotten my hopes up for this film even though I had every intention of checking it out. I was happy with what I saw, and I'm now very interested to finish the book and see just how different it actually is. World War Z is an entertaining film and I would recommend it to anyone looking for a good summer blockbuster. - On a couple different occasions, Gerry and others are shown preparing to come in contact with the zombies (wrapping their arms and legs in magazines and duct tape). I can only assume that these are actions that may have been detailed in Max Brooks' other book The Zombie Survival Guide: Complete Protection From The Living Dead. If it was, it was a nice little nod. And if it wasn't, it should have been. - I liked how the crazy, tidal wave-like herd of zombies laying siege to Jerusalem played out in the film. The scene of them crashing against the wall in the trailer looked cool, but the way it built up in the movie worked out well. - I also liked that Gerry and his family took Tomas in after they all escaped his building, although I thought it was a little odd that Tomas never showed any emotion over losing his family. I also wonder what happened to Tomas after Gerry's family was re-allocated to the 'safe zone' in Nova Scotia? - I liked the twist that the virus that caused the outbreak needed a viable, healthy host and that it completely ignored those it 'felt' were sickly. - Between this and Iron Man 3, James Badge Dale is having a pretty good summer in supporting roles. Whenever I see him, I always think of 24. - Those credited in for film writing for World War Z: Damon Lindelof and J. Michael Straczynski. Wasn't Tomas waiting on the beach for Gerry with the family in Nova Scotia? He may have been...if so I must have missed it!